Hagi (萩)  is one of Japan's most beautiful castle towns, with many old streets and residences that have survived untouched to the present day. 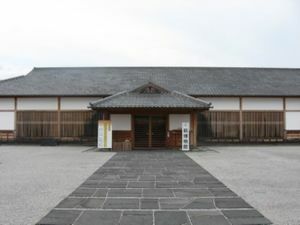 The first castle in Hagi was built by the Yoshimi clan. But it was not until 1608 when the Mori clan, exiled here after a humiliating defeat by the Tokugawa shogunate, built their massive, imposing castle at the foot of Mt. Shizuki. The Mori clan transferred the capital of the Choshu Domain (Choshu-han) from Hiroshima to Hagi at the same time, where it remained the political center of the region for over 250 years. In the middle of the 19th century, the Choshu allied with the Satsuma Domain to deliver some long-awaited payback, toppling the Tokugawa shogunate and thereby spurring the Meiji Restoration — and, with it, the modernizing of feudal Japan. Many Meiji statesmen were born and raised in Hagi, such as Hirobumi Ito, the first Japanese Prime Minister. Hagi-Iwami Airport (IWJ)  has one flight per day from Haneda (Tokyo) and Itami (Osaka) on ANA. Shuttle buses run from the airport to the city (80 minutes). Yamaguchi Ube Airport (UBJ)  in Ube is the prefecture's largest airport, with regular flights to Haneda Airport in Tokyo on JAL and ANA (about 90 minutes). From Ube, take a bus to Shin-Yamaguchi Station in Yamaguchi and connect via bus from there (see below). The closest Shinkansen station is Shin-Yamaguchi. Many Hikari and a few Nozomi trains stop there. The train link to Hagi from here is about 3 hours by limited express, but you can cut that in half by taking "Hagi-go" (はぎ号) bus to Hagi. It's run by Chugoku JR Bus . If you want to take the train the full distance to Hagi, you'll want to take the Shinkansen to Asa station. Asa is only serviced by Kodama trains, and it is two stops from Shin-Yamaguchi and also two stops from Kokura, which is much more well serviced. From Asa take the Mine line to Nagatoshi (1 hour). Then take the San'in Line to Higashi-Hagi Station (half hour). You need to be careful to plan the conections well (both trains average about once every two hours), but if you do, this is about the same time as the bus from Shin-Yamaguchi. If you like coastal scenery, you could also take the San'in line all the way from Shimonoseki, but this adds anouther hour. When considering the train vs. bus question. You need to consider that local rural trains are not particularly comfortable nor do they have air conditioning, and for the bus, people that have trouble with motion sickness will have problems with the winding mountain highways, especially the way they are driven by these busses. The city center is on a delta between the Hashimoto River and the Matsumoto River. If you decide to walk, you're joining a long tradition — Hagi-Oukan (萩往還), which connects Hagi and Yamaguchi City, was an important route during the Edo period, traveled frequently by merchants and samurai. It's now a popular trail for history-minded tourists. The Hagi Junkan Maaru Bus (萩循環まぁーるバス) runs 7AM-7PM to almost all of the tourist sights. There are stops throughout town, but the two routes — blue and red — cross paths at a few points, including the Hagi Bus Center in the center of town. There are departures every half-hour or so. Rides of any length cost only ¥100, or ¥500 for a day pass. The blue buses cover the north, west, and northwest parts of the city, including JR Tamae Station, the castle ruins, and the Horiuchi, Jokamachi, and Teramachi areas. The red buses cover the south and northeast, including JR Higashi-Hagi Station, Daisho-in, and sites further out such as Kasayama and the Reverberating Furnace. Most of the major sights can be easily reached by bicycle. You can rent one at several places around town, such as JR Higashi-Hagi Station and Hagi Castle. The Chōshū Five (長州五傑 Chōshū Goketsu) were members of the ruling class of the Chōshū-han. In 1863, they disguised themselves as English sailors and went to study in England at University College London, despite the policy of sakoku, which made leaving Japan illegal under penalty of death. Each went on to play a major role in the modernizing of Japan, and they remain heroes in Hagi today. Masaru Inoue - known as the "Father of the Japanese Railways"
Keep an eye out for "bent key" (kaimagari 鍵曲) paths while wandering through the castle town. These sharp right angles were designed to confuse enemies and make it easy for warriors who knew the terrain to corner them, so adjust your invasions accordingly. The Horiuchi area (堀内), just southeast of Shizuki Park, was a residential section for wealthy merchants and the samurai elite. Many old houses, temples, and shrines remain in good condition, with virtually no modern structures among them. Just to the east of Horiuchi, the Jokamachi area also has several interesting old houses that are open to the public. Continuing east from Jokamachi, the Teramachi area features a cluster of old temples that were intended to double as barracks in case of enemy attack. Among the notables is Jonen-ji, whose carved front gate was transported from Kyoto by the Mori clan. This area is a few minutes southeast of JR Higashi-Hagi Station, across the Matsumoto River from the city center. In the southwestern part of the city is the Hiyako area (平安古), which features a few museums of interest and more old houses that are open to tourists, such as that of Giichi Tanaka, another former Prime Minister. In the southeast corner of the city, the Aibagawa Canal (藍場川) was built for transportation of goods, and also to supply water for extinguishing fires. Today, the path along the canal makes for a nice stroll. Kasayama (笠山) is the smallest active volcano in East Asia, and offers panoramic views of the Sea of Japan. Look for the lovely camellia flowers during February and March, and the small Myojin Pond at the foot of the mountain, which houses saltwater fish. It's accessible from JR Koshigahama Station, which precedes Highashi-Hagi on the San'in Line. Amidst all of the old samurai atmosphere, don't forget that Hagi is on the Sea of Japan — there's swimming to be done. Try Kikugahama, a popular beach to the east of Mt. Shizuki and north of the city center. Hagi-yaki (萩焼) is the local form of Japanese pottery and the top souvenir from a trip to Hagi. It is unique because of the way it reacts to water; over time, you'll notice delicate changes in its color. A few pottery shops offer visitors the chance to cast their own hagi-yaki — check with a tourist information office to see what's currently available. The Tamachi arcade runs through the center of town with an array of small shops, modern and traditional. Souvenir shops are also clustered around the castle. 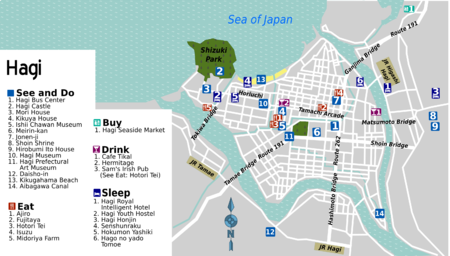 Another option is the Hagi Seaside Market  (9:30AM-6PM), a complex of shops and restaurants that sell fresh seafood and hagi-yaki. Kenran Beef (見蘭牛) is a local specialty. It has a fatty, marbled texture and tenderness. Most hotels will have it on their dinner menu. 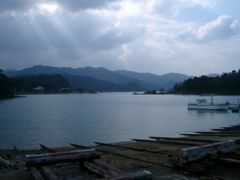 Hagi is also a great place for fresh seafood, particularly sea urchin and squid. Chonmage beer (チョンマゲビール) is a local brew. Hagi also has a few traditional sake factories, with bottles available at souvenir shops. If you're planning to splurge on a traditional Japanese inn, Hagi is a great place to do it; the art of the ryokan is taken seriously here, and the atmospheric old quarters are well worth an early morning or late evening stroll. The local ryokan association  has a booking desk at the Hagi Bus Center (9AM-5:30PM, tel. 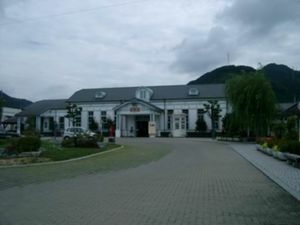 +81 0838-22-7599). This page was last edited on 18 January 2019, at 02:29.